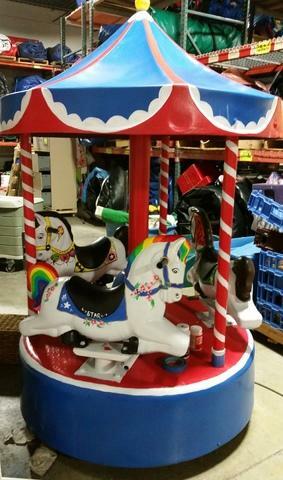 Our Pony Carousel is one of a kind, customized and hand painted by our staff! This ride is perfect for small children up to age 5. Three children can ride at a time, each ride is approximately 2 minutes. Speed of the carousel can be adjusted so parents can walk beside small children. Kids can choose their favorite horse to ride: Star, Safari, or Hero! This ride requires a standard outlet to plug into to operate.